So last weekend we were invited over to a friend’s house for dinner and I was pondering what to bring as dessert. 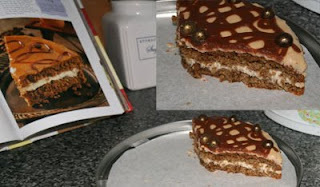 I browsed through my cake book that my dear mom gave me at Christmas and my eye fell on a Coffee/Ginger dessert-style cake. I love coffee, and ginger and a cake combining the two seemed like a great idea so I went for it. Now in the all too perfect picture of the cake in the book, it looks like a reasonable sized cake to cut in half. I don’t know if my version did not rise as it should have or if I knocked some of the air out while folding, but when the cake came out of the tin and I saw what I had to cut in half, my stomach did a bit of a back-flip. But I had my darling man to the rescue. I voiced my trepidation for the challenge ahead and he managed to whip up an ingenious cake-cutting guide in no time at all. This cake-cutting gadget consisted of 2 wooden rods, coincidentally about half the height of the cake, placed in a ‘V’ shape on either side of the cake that guided my knife so I did not go off center and ended up with a perfect cut. I was super impressed and could not stop grinning. Who needs those pricy kitchen gadgets? Not me! So after filling and icing and decorating the cake I was fairly happy with the results, but I cannot say that it was my best ever creation. This weekend the order of the day was Biscotti. I had read a post on my favourite foodie blog ‘Smitten Kitchen’ about Biscotti and as I had not made any for a few months I thought I’d try my hand at the Chocolate Hazelnut ones posted on her blog. I love the super crunchiness of biscotti and how they are butter-free and thus slightly more guilt-free than regular biscuits. They are the perfect dunkers as they will rarely go soggy and end up falling in your coffee/tea/milk and these hazelnut/chocolate ones are not too sweet or rich, they are just perfect. Have a go at the recipe on Smitten Kitchen. Here is a warning though, the dough is super, super sticky, so flour your work-surface very, very, very well or it might get even more messy than it should be. 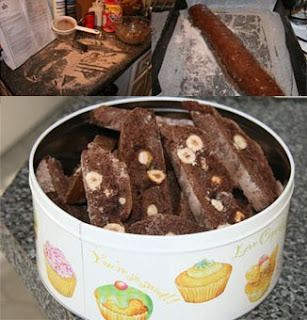 This recipe makes quite a lot of biscotti so have a few greased & lines trays ready for the dough-rolls – mine barely fit in my 2 biggest trays!